Typical auto oils don’t contain corrosion inhibitors marine engines need to guard against the uniquely harsh environment that marine engines operate in. 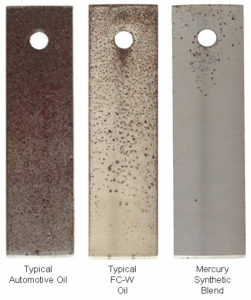 In the example to the right, samples have been cut from the actual cylinder walls of marine engines that were run with automotive, typical marine and Quicksilver oil. 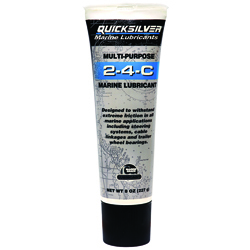 As you can see, the Quicksilver oil offers the best protection against corrosion. Imagine driving your car at 80 mph while pulling a boat while driving up a 30 degree incline—all the time. That’s the kind of stress your marine engine is under. Automotive oil is simply not designed to withstand the marine environment. Automotive engine oils are designed to operate in wider outside air temperature ranges than marine oils. In order to operate as efficiently as possible over these large temperature ranges, automotive oils use viscosity Improvers (VI). This is a bit of an oversimplification, but VI are added so that oil can be as thin as possible while still meeting desired performance characteristics over wide temperature ranges. But VI aren’t necessary in marine engines because it is more beneficial for marine oil to as thick as possible and still operate efficiently. Simple enough, right? Well, it gets a bit more complicated since a number of marine engine oils on the market today may not be true marine engine oils. 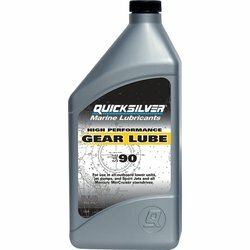 There is nothing that prevents a company from taking automotive engine oil and labeling it as marine engine oil. If you check your sterndrive or inboard owner’s manual, chances are your manufacturer recommends the use of an FCW® certified marine engine oil. FCW certified oil has been approved by the NMMA (National Marine Manufacturers Association) for use in four-stroke marine engines. To help boaters protect their investment and to ensure a positive boating experience, the NMMA and leaders in the marine industry have developed a four-stroke marine oil certification called FCW. Products that have the FCW have met minimum testing and quality standards. There are roughly a dozen tests conducted to review viscosity, corrosion, filter plugging, foaming and aeration. In addition, the oil must successfully pass a 100-hour general performance engine test. Engine manufacturers such as Mercury Marine perform additional tests to ensure that our oils exceed these minimum standards. To learn about the NMMA go to www.NMMA.org. 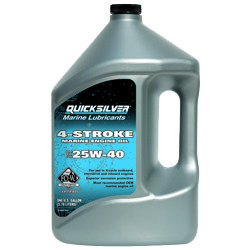 All Quicksilver four-stroke engine oils are FCW certified by the NMMA.